A long tradition continues in 2016. Ever since 1955, the Austrian Army has provided valuable support during final preparations for the Hahnenkamm Races. This year they are led by First Lieutenant, Gernot Strobl, and Lieutenant, Florian Bruckner. Around 100 soldiers from St. Johann/T. Base (Fusilier Battalion 24) were officially welcomed by K.S.C. President, Michael Huber, in sub-zero temperatures at the base terminal of the Hahnenkamm cable car. 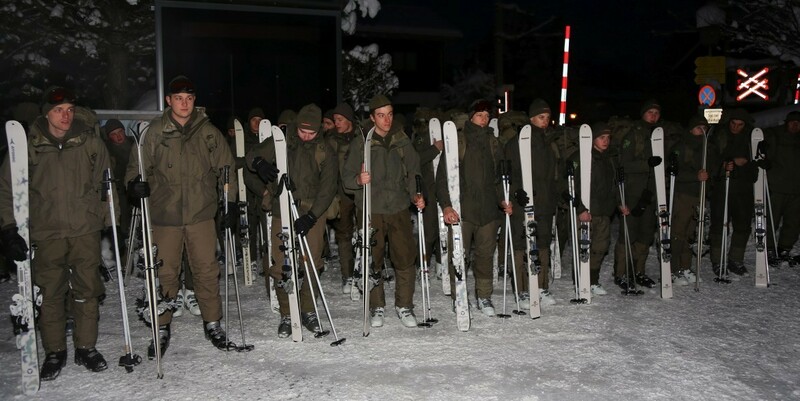 The recruits were already underway on the “Family Streif” on Friday to gain their first impressions of the prevailing conditions. The troopers undergo special advance training in order to prepare for their assignment on the Streif, which includes climbing and ski exercises as well as instruction on the handling of special equipment. Each and every soldier is highly motivated and ready to give 100 per cent. If necessary, a further 50 soldiers are on standby to join the 100 already on site within 24 hours. Downhill Chief of Piste, Herbert Hauser gave instructions to individual section managers before the experienced commanders led their men out on the original Streif. In conclusion, Slalom Chief of Piste, Stefan Linder, wished the whole team „some great racers together“.